If you’re hosting a gift exchange with your friends, family, or colleagues, try our new Secret Santa gift exchange template by following these instructions. This template will allow you to quickly send out a form to collect the necessary information from participating guests. 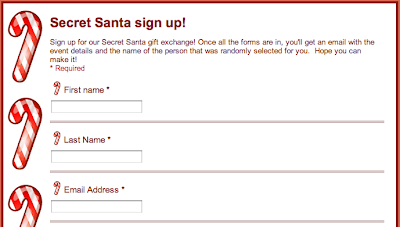 Then, using a Google script, the form will assign Secret Santas and send automated emails to guests with all the details - no folded paper scraps necessary. Browse the template gallery for more ideas, or submit and share your own templates for others to use. Wishing you the best this holiday season!